If you want to get a up to a 100% return on your investment, there is no way to get it faster than a new deck. Some experts say that you can expect a 100% return. It is no secret that your home is your biggest investment. A great way to add significant value to your home is to add a backyard deck. There is no better way to reward yourself with a wonderful place for relaxation and leisure. Imagine yourself sitting on your new deck with your morning coffee and the newspaper, or sitting on the deck in the evening watching the stars and having a favorite beverage. A deck makes a statement, and while it may not be the most important “room” in your home it won't be long before it is your favorite “room,” and create an outdoor oasis. 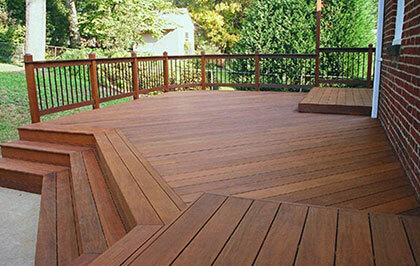 You can have a more extensive decking solution with a beautiful wrap-around deck. This deck extends around multiple sides of your home and you would have the option of having the deck completely encircle your home. A wrap-around deck gives your home the ultimate curb appeal. If you already have a deck, but it is need of work, there is a multitude of materials which can add to the overall comfort and beauty of your deck. We can make it more accessible with stairs or safer with attractive railings. Anything you can imagine for your deck, chances are, we at Construction Unlimited, LLC can make it happen. Once you have that great addition to your home, it is important to maintain your newly built, or newly restored, deck. Proper maintenance will prevent repairs while protecting your investment. Most decks will need cleaning and sealing on a yearly basis to protect the wood. We have clear deck sealers and colored stains. Generally the clear sealants are used as water repellants so that water doesn't stand on your wood and cause it to warp or buckle. Colored stains are also water repellant and offer an additional benefit of UV protection. The pigment in the colored stains protect wood from harmful UV rays. There are many things that are going to determine the cost; including the size, materials and type. However, a deck is a wise investment and adds significant value to your home. We will work with you to accommodate any budget.